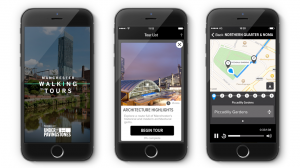 magneticNorth has worked alongside Manchester City Council and NOMA to create a walking tours app for iPhone users. The hope is that it can encourage residents and visitors to find new ways to explore the city using the phone’s GPS to trigger audio content. The app will launch with 2 tours, one looking at the architecture and the other concentrating on the Northern Quarter and NOMA district - NOMA is the 20 acre site currently being regenerated by The Co-operative Group. More will be added in 2015. By utilising audio and GPS, it means that users don’t have to look down at their screens - although there is an onscreen map to show where you are and the tour. “We are thrilled with the app and are keen to add more features and grow the number of tours available. We hope that over time, more organisations choose to create audio tours with us and we can extend how we control and manage content to meet a multitude of needs,” said Lou Cordwell, CEO at magneticNorth. It’s currently a pilot project and is limited to the iPhone, although the aim is to make it available across multiple platforms. The app was created using mN’s Under The Paving Stones digital platform, which enables people to create a custom audio and visual experience of a place. “The Manchester Walking Tours app showcases the culture and history of Manchester, highlighting the outstanding historical and modern buildings throughout the city and exhibiting the vibrant art and nightlife scene of the Northern Quarter,” added Sir Richard Leese, leader of Manchester City Council.